Paul's Fishing Kites now stocks 10 kg bags of Salt Flake Ice from Brass Monkey Ice Ltd. There is no better way of keeping your catch fresh and it's the same price you would pay at their ice factory! Salt ice mixed with a little sea water melts at below zero degrees and will chill fish fast. Fish which has been killed immediatley after capture and chilled in an ice slurry will last three to four days longer than fish that have not been iced properly. All commercial snapper longline fishermen and most decent charter boats take out salt ice because of the way it chills fish so quickly. Another benefit is the flakes of ice are softer and won't damage fish like party ice can often do. 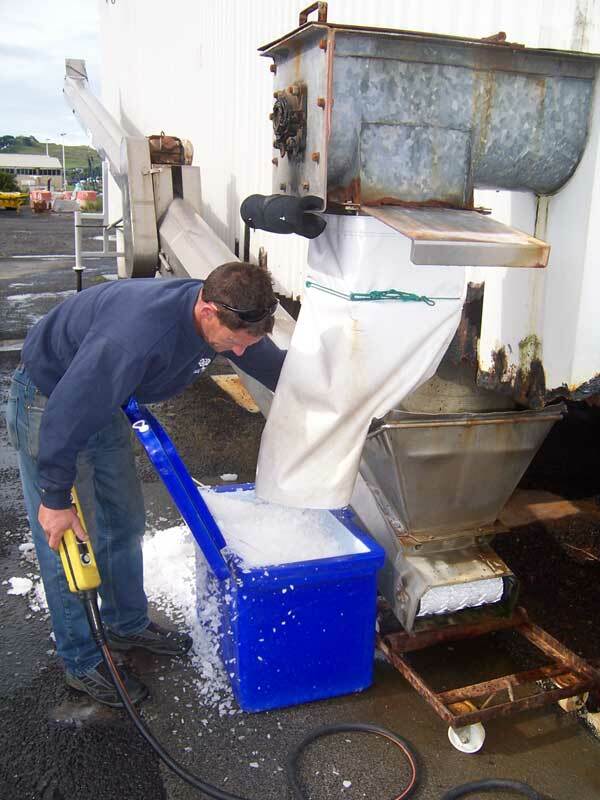 Salt Flake Ice is made at our plant sited at the entrance to the Ports of Auckland wharf at Onehunga. We use two Atlas Slice Ice machines that can be run individually or in tandem. Each machine has a production capability of one tonne per hour so the plant is capable of producing 50 tonne per day. The machines use potable water from the city supplier – Metrowater. Water is sprayed on to twin vertical cylindrical drums, rotating slowly on each machine. The drums have refrigerant circulating within them which causes the external surface of the drum to become extremely cold which in turn freezes the water which has been sprayed on to them. A set of knives or cutters are placed with slight clearance, vertically against each drum and these knock the forming ice from the drum as it revolves. The tempreature of the flake ice is between -6 degrees C and -12 degrees C in flakes of various size up to 6 sqare cm and 3mm thick. 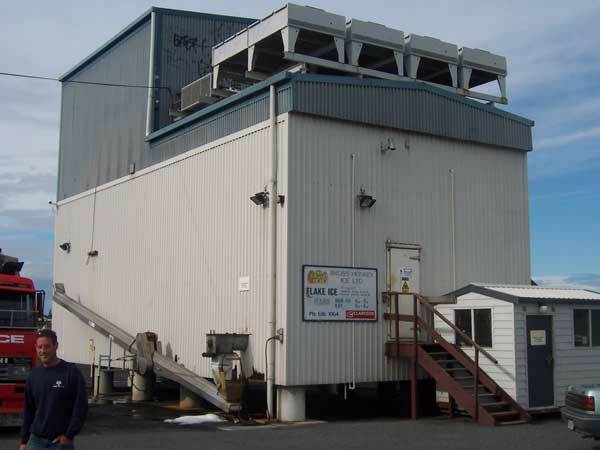 It falls off the machines and into a refrigerated, insulated bin (120 tonne capable) positioned below the ice makers, where it is stored at similar temperatures until sold. Salt is added to the water just prior to it being sprayed on the drums. This is done via a dosing pump drawing from a brine tank and adds up to 500 grams of salt per tonne of ice, corresponding to a maximum of 2.2 litres of saturated salt solution per tonne of ice. The salt content is barely discernable to taste. It is added to the water to assist the formed ice to break away from the drums and to break away in larger pieces. Salt Flake Ice has been the preferred medium in the Commercial Fishing Industry for lowering the temperature of fish when it is initially caught. This is often done by loading the catch into slurry bins (combination of seawater and flake ice) at approximately 3 degrees C to quickly bring their temperature down. After a short period they are then transferred to 30kg capacity fish bins where they are layered with flake ice on the bottom, between layers and on top. The flatness of flake ice offers a large surface area whereby rapid and efficient cooling of the product is enhanced. This guarantees the freshness and natural appearance of the fish for up to a five day trip back to port and the markets. We operate under guidelines formulated between the Ministry of Fisheries and the previous owners of Brass Monkey Ice Ltd.
We use potable water as supplied by our Local Authority via Metrowater. Salt is Pacific Grade 11 Sola Crushed Course supplied by James Crisp Ltd.
We carry out a sanitizing program at all points of possible contamination which basically is regular spraying using a Ministry of Fisheries approved sanitizing agent called Enviro Safe. We engage NZ Laboratory Services Ltd. to regularly test our product for both Total Coliforms & Faecal Coliforms. Recreational fishermen are realizing that technology used by the Commercial fishermen for years can be applied to their catches. Salt Flake Ice is colder than regular party ice and hence lasts longer - up 3-5 times longer in quality chilly bins - and the salt assists in reducing bacteria on the fish skin, hence maintaining a fresher and better tasting top quality fish for the table.